Lock in a great price for Black Rose Beach Suites – rated 9.2 by recent guests! A Villa resort that puts you on the beach and walking distance to many resturants and shops. Their onsite pool Bar is amazing and provided excellent service with a mixologist that uses fresh herbs etc to craft the perfect cocktail. I was worried about the other reviews when I heard complaints about loud music at the pool which we didn't experience, instead it was more like a cool relaxing vibe. Our hostess was amazing and could not do enough to make our stay a pleasant one. The Villas are gorgeous, hard to find these in this area and they only have about 6, so if you have an opportunity and they are available book it! They provided a fabulous breakfast ( you request the food you want) that was brought to our room each morning. Truly a Gem to stay at!! Amazing private pool in the room, staff was very helpful, location was great, right in front of a very nice beach. Also there's the pool bar in the hotel which has a nice pool and good drinks. The room is huge, totally worth it. Perfect location on Perivolos beach and just next to all restaurants, bars and shops that are lining-up till Perissa beach. Large common swimming pool with a cocktail bar and we had also a large private pool that goes with the suite. The breakfast on our sunny terrace was awesome,, with all that we had ordered (nice greek yoghourt ...). Staff was always smiling and helpful. -The beach 1min walkin distance -The breakfast in the room -Loads of delicious restaurants walking distance -Very quiet area at night -Sissy extremely helpful and always with a smile on,very sweet girl! -The maid who clean the rooms extremely sweet woman. Sissy was the most amazing host and went out of her way to say hi to us everyday and show us other activities that we could do in santorini while still letting us enjoy our alone time, the breakfasts are amazing and you can choose what to have and what time they deliver it to you every morning, the cleanliness of the rooms is 10/10 and the maid is just polite and delightful, by far the best hotel and staff we have experienced, the bartender makes the most amazing cocktails too!! Location is beautiful. Bed is comfortable. Breakfast was delicious. We enjoyed every minute of our stay. The suite was so cosy, we loved everything there. Our own pool outside, the breakfast was delicious, the staff was so nice and friendly and especially Sissi, she will help you with what ever you need, she reads every wish of your eyes. We had such a good time thanks to her. We will be back soon. Best place to stay in Santorini. Spacious suite with beautiful terrace and private pool towards the sea. Perfect location for quite holidays right in front of Perissa beach. Delicious breakfasts with food of your choice and the timing to serve (09.00 – 11.00). It takes about 25 minutes to get from the airport and the same from Fira. Relaxing pool bar with excellent cocktails, delicious food and good music. Very kind, polite and helpful personnel. Thank you all for all your help! Just 100 feet from Perivolos Beach, Black Rose offers modern Cycladic-style suites most with a private pool. The communal pool is surrounded by a wooden deck with sun beds and grass umbrellas. Facilities also include a Jacuzzi™, massage treatments and a snack bar. 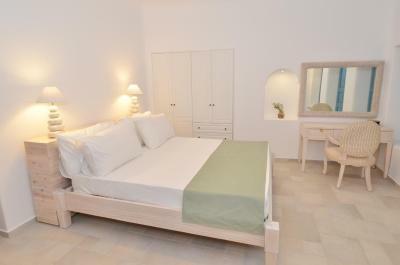 Each whitewashed suite opens to a private patio with pool, garden or Aegean Sea views. Featuring built-in beds and a fireplace, they include a flat-screen TV with DVD player, mini-bar and air conditioning. 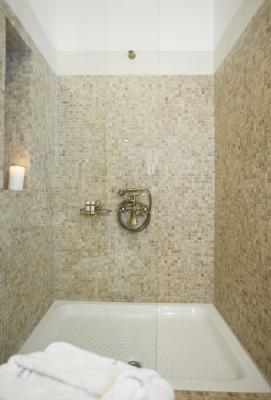 Korres Natural Products, slippers and bathrobes can be found in the bathroom with its mosaic tiles. Some suites have also a spa bath. Guests at Black Rose Suites can start their day with a traditional Greek breakfast served in the room or at the poolside snack bar. 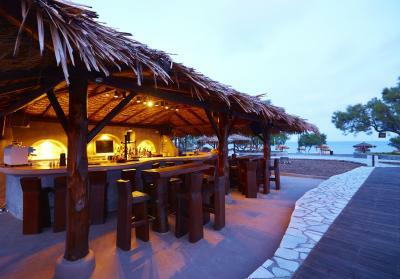 Seaside taverns and bars can be reached within a short walk from the property. 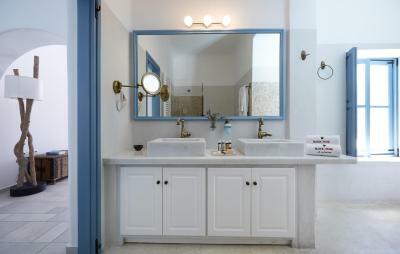 Black Rose Suites is located 6.2 mi from Santorini International Airport and 3.1 mi from Athinios Port. Free Wi-Fi is available in public areas. Complimentary private parking is possible on site. When would you like to stay at Black Rose Beach Suites? 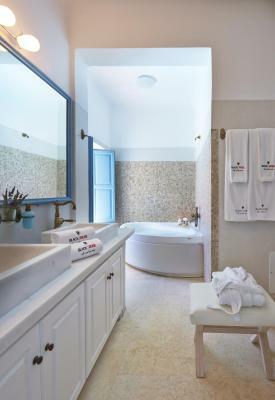 Just 164 feet from Perivolos Beach, this Cycladic-style suite opens to a patio with views to its private pool, garden or Aegean Sea. Featuring built-in beds and a fireplace, it includes a flat-screen TV with DVD player and air conditioning. 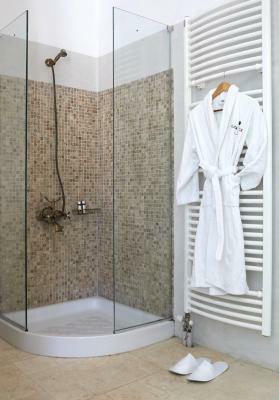 Free toiletries, slippers and bathrobes can be found in the bathroom with its mosaic tiles. Some suites have also a spa bath. Featuring sea views from its balcony, this split-level suite of 40sqm. includes king sized beds, comfortable sitting area, luxuriously furnished patio or terrace and marble bathroom with shower or bathtub. It is equipped with air conditioning, direct dial phone, WiFi, safe deposit boxes, mini bar with premium brands, hairdryer, flat-screen T, DVD & CD players, Korres Natural guest amenities. This suite features a fireplace, air conditioning, direct dial phone, WiFi, safe deposit boxes, mini bar with premium brands, hairdryer, flat-screen T, DVD & CD players, Korres Natural guest amenities. 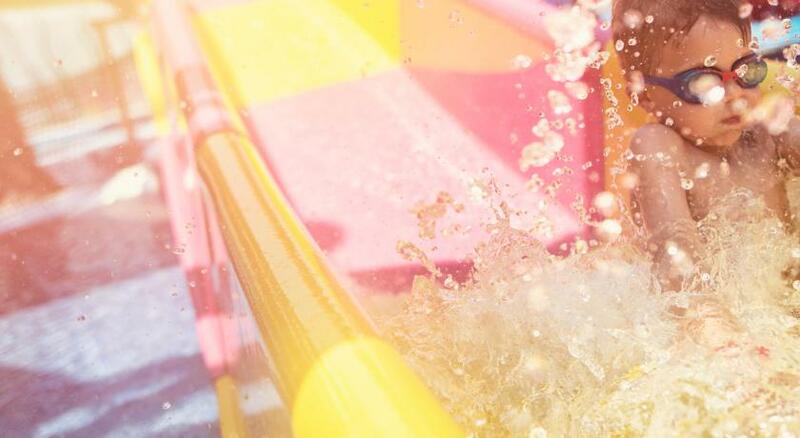 House Rules Black Rose Beach Suites takes special requests – add in the next step! Black Rose Beach Suites accepts these cards and reserves the right to temporarily hold an amount prior to arrival. Tiny bath tub fit for a child only - no shower. Personal pool was freezing. We could not use. Beach bar closed and no beds on the beach. No top of services after 5pm. Super room with private pool. Excellent breakfast and friendly staff. Breakfast is served in the room and is very rich. Exceptional Greek omelets. Staff is superlative. Cocktails made from the barman in the swimming pool are particularly good, just let him guide you to experience new tastes (he even makes his own syrups made from herbs around the garden)... And best of all it is the only structure in front of a free beach (not busy in the least), no awful bathhouses in front of it, you simply switch from the swimming pool to the sea and back. We had our own small pool and sitting area which was simply wonderful. Very private and comfortable. Attentive and caring staff and very very good breakfast. Lots of nice restaurants nearby. The bathroom although spotlessly clean could have done with a bit of a freshen and although some rooms have a separate shower ours didn’t it was over the bath and there was no where to hang it up whilst showering and we showered the floor as well as us !!! We felt the bathroom let it down a little in our room for the price so if you want a separate shower ask for a room with one . Everything at Black Rose was beautiful staff were helpful friendly and nothing was too much trouble . The breakfast served on your own private terrace was luxury and the private pool perfect. Pretty much everything! Great location, good service, sumptuous breakfast, beautiful pool and a nice beach. Special shout to Sissy for stellar restaurant/tour recommendations and taking care of us. The awesome duo of Mike and Dymos at the pool bar, made our time really memorable.